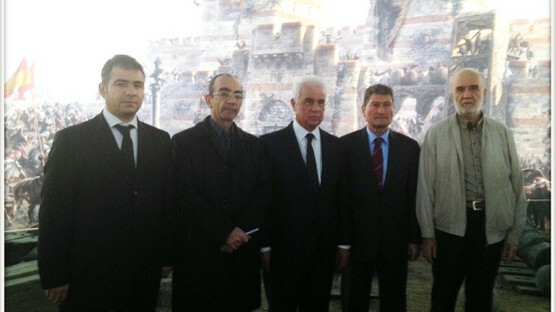 Applications have started for the painting and essay prize contest known as “The Conquest of Istanbul and Panorama 1453 Historical Museum” organized every year by the Istanbul Provincial Directorate of National Education and Kültür A.Ş., an association of Istanbul Metropolitan Municipality. 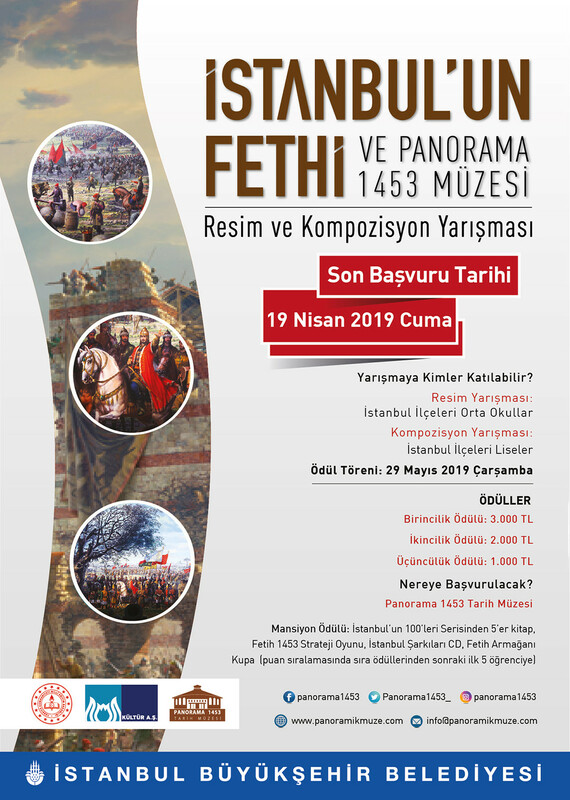 The painting and essay contest “Conquest of Istanbul and Panorama 1453 Historical Museum” aims to bring to light the conquest and panorama in the dreams of students. 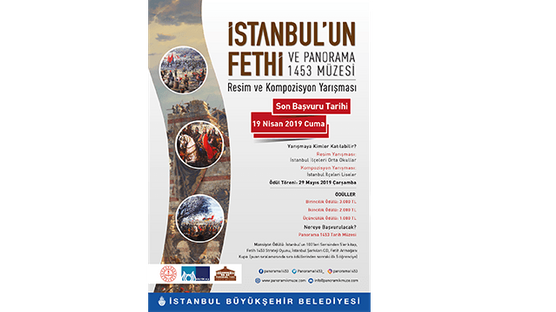 Students will visit the Panorama 1453 Historical Museum, which presents a three-dimensional illustration of the conquest of Istanbul, and they will express their feelings and opinions with stories, essays or paintings. 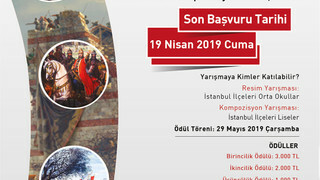 High school students from all districts of Istanbul can apply for the contest in the field of essay, while mid-school students can apply in the field of painting, and the applications for the contest will end by April 19, 2019. Essays must be written as per the grammar and orthographic rules of the Turkish language on A4 papers with the font size 12 in Times New Roman with limitation to 2 pages. Essays must be printed out and include student’s name, surname, class, name of the school and contact information. Paintings must be on 35 x 50 drawing papers. All charcoal drawings, watercolor paintings, and pastel drawings will be accepted to the contest. In both branches, essays and paintings must be original and unpublished or non-exhibited anywhere in part or as a whole. In addition, they must not have ranked in any contest before. They must be free of any excerpt or copy of any other work of art. Students may apply to the contest through their school or by submitting their application form to Panorama 1453 Historical Museum at the address Merkezefendi Mahallesi, Topkapı Kültür Parkı, Topkapı - Zeytinburnu / Istanbul by hand or via mail. 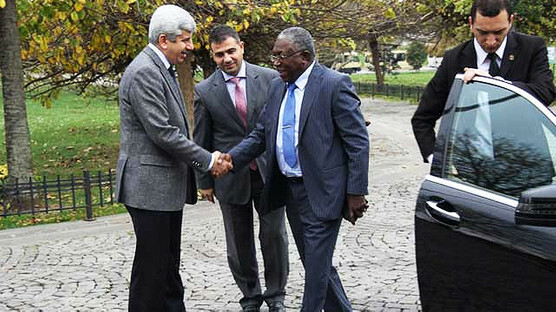 A commission designated by the Istanbul Provincial Directorate for National Education and Directorate General of Kültür A.Ş. – an association of Istanbul Metropolitan Municipality – will select the works of art which will rank first, second and third in the contest. In both branches, students who will rank first will be granted TL 3,000; students who will rank second will be granted TL 2,000 and those who will rank third will be granted TL 1,000. In addition, 5 students will receive honorable mention. Each student who is entitled to honorable mention will be granted 5 books from “100’s of Istanbul” series by Kültür A.Ş. Yayınları, the Conquest Game, Istanbul Songs CD, and the Conquest Gift Cup. And each participant school will be granted a painting. Applications for the painting and essay contest for mid-school and high school students will end by April 19, 2019. 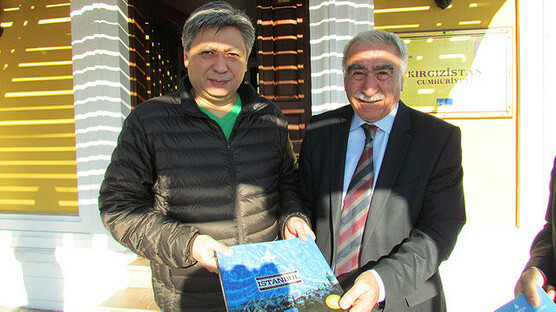 The results of the contest will be announced on May 17, 2019.